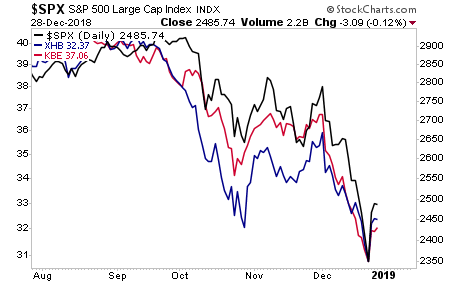 Last week’s rally was the result of multiple interventions. “Someone” took advantage of the extremely light holiday volume to ramp markets higher via indiscriminate buying. The media is trying to portray this action as the result of “investors” or “value seekers” but neither of those groups was involved. This was a clear and obvious buying program made by “someone” who didn’t want stocks to officially enter a bear market by falling 20%. One of the key “tells” that this was manipulation is that underperformers like banks and homebuilders didn’t lead the rally. Normally during real market bottoms, the underperformers turn first and rally hardest as REAL buyers and value investors put in REAL buy orders. That didn’t happen. Both sectors lagged on the bounce. So what was that rally? 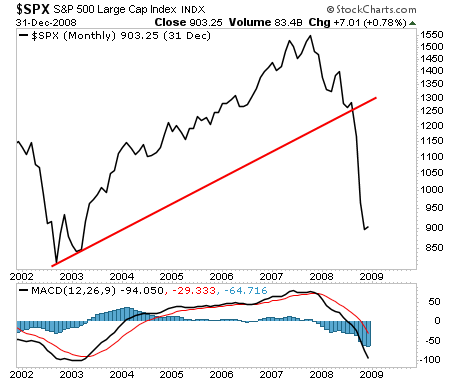 It was a dead cat bounce that is offering traders a final chance to prepare for what is coming. The bull market in stocks is over. 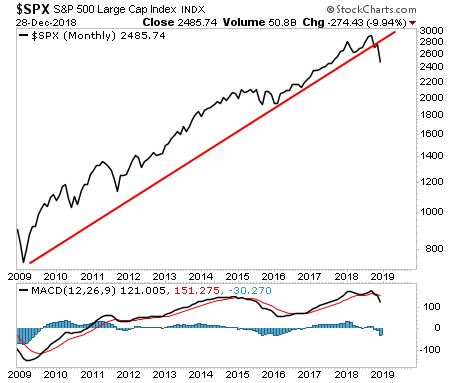 We have a confirmed break of the bull market trendline running back to 2009. We also have a confirmed SELL signal on the monthly MACD. The last time we had BOTH of these was in the middle of 2008… right before the markets entered liquidation mode. The time to prepare is NOW before it happens.